New York, United States, Friday 28 September 2018 – Popular African-American Singer, Songwriter, businessman, record producer, actor and philanthropist, Aliaume Damala Badara Akon Thiam has promised 5,000 solar street lights and 2,500 traffic lights to support President Bio’s New Direction agenda in Sierra Leone. During a courtesy call on President Bio in New York, Akon praised him for his dynamic leadership, adding that: “He is a smart guy and understands where the country needs to be.” He stated that he was very impressed with President Bio’s leadership and expressed hope he would do well for the West African nation. 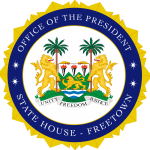 The President thanked Akon for the support and invited Akon to Sierra Leone. Bio also called on Akon to help the Government in rebranding and marketing the potentials of Sierra Leone to boost tourism and attract foreign investment. The electrification of Sierra Leone is central to the success of the New Direction and President Bio has always been passionate about increasing citizens’ access to electricity. The provision of 5,000 solar street lights and 2,500 traffic lights will be part of Akon’s Lighting Africa Initiative which aims to provide electricity by solar energy in Africa. The project was launched in February 2014 by Akon, Thione Niang and entrepreneur Samba Bathily to develop an innovative solar-powered solution that will provide access to a clean and affordable source of electricity in Africa. Press Secretary and Presidential Spokesman, Yusuf Keketoma Sandi, said that: “The huge commitment by Akon to provide 5,000 solar street lights and 2,500 traffic lights has shown that President Bio’s impressive leadership within six months is galvanizing international goodwill to improve the lives of ordinary Sierra Leoneans. The international community has reposed confidence in a President who continues to demonstrate passion to effect real change and rebrand his country”.